When Neil Armstrong set foot on the Moon’s surface in July 1969, it was not only a giant leap for mankind, but was also thought to have been the first time the satellite had ever hosted life. The lunar world was said to be a "dead rock", lacking the volcanic activity needed to create an atmosphere and without sufficient gravity to trap the molecules needed for microbes to evolve. But now, scientists from Birkbeck, University of London and Washington State University have found that conditions on the lunar surface could have supported simple lifeforms around 4 billion years ago - roughly the same time that life was getting started on Earth. During both periods, the Moon was spewing out large quantities of superheated gases, including water vapor, from its interior. Not only did it create an atmosphere, but the escaping steam could have condensed into pools of liquid water on the Moon’s surface, becoming a perfect breeding ground for microorganisms. Dr Dirk Schulze-Makuch, an astrobiologist at Washington State University, said: “It looks very much like the Moon was habitable at this time. There could have actually been microbes thriving in water pools on the Moon until the surface became dry and dead. The findings are based on data from recent space missions and analyses of lunar rock and soil samples that show the Moon is not as dry as previously thought. It is thought the Moon was formed when a large planet, dubbed Theia, crashed into Earth, creating a huge debris disc which eventually swirled together to form the satellite. While today’s Moon is silent and sterile, around four billion years ago it would have been firey and active following its dramatic birth. Although the conditions were present for life to evolve in the Moon, as it did on Earth, researchers think it is far more likely that it was brought be a meteorite. 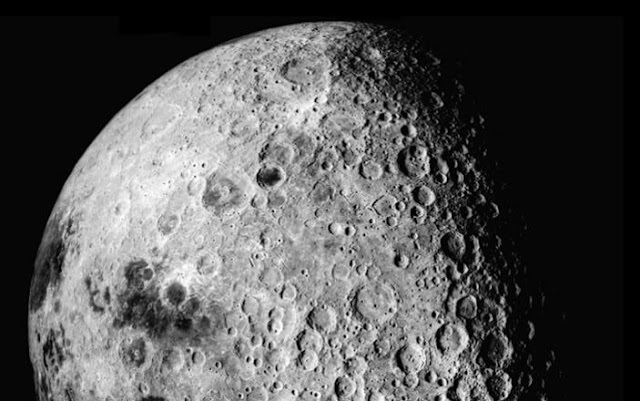 Ian Crawford, Professor of Planetary Science and Astrobiology at Birkbeck, University of London said: “We know we have lunar meteorites on the Earth, so it may well be that a chunk of Earth carried life to the Moon. “ If we can drill down and find evidence of early life it could show us what life was like on the early Earth. “I am sure the Moon is completely dead now, but it once would have been very active and we have evidence from the Apollo missions of lava flows dating back billions of years. The earliest evidence for life on Earth comes from fossilized cyanobacteria that are between 3.5 and 4.2 billion years old. During this time, Solar System bodies were frequently bombarded by giant meteorite impacts. It is possible that meteorites containing simple organisms like cyanobacteria could have been blasted off the surface of the Earth and landed on the Moon, seeding it with early microbes. However the window of opportunity for life had closed by around 3 billion years ago, with the Moon cooling to such an extent it no longer gave off the gases needed to maintain its atmosphere. It also lost its protective magnetic shield, which allowed solar winds to strip away atoms. 0 Response to "Life may have existed on the Moon four billion years ago"